Communal entrance hall: spacious entrance hall with a tiled floor with private door leading into the flat. The accommodation is all on ground level with exposed wooden floorboards in the living areas and no internal steps, so would be suitable for less mobile guests. 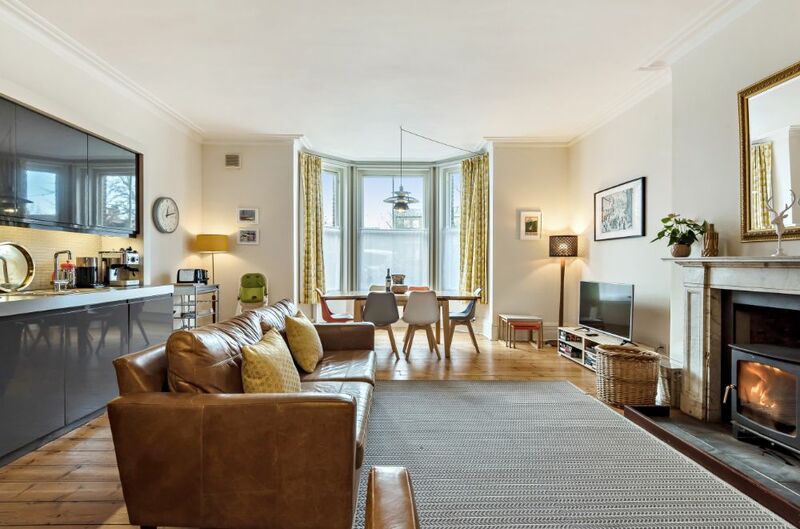 Living area: this is a superb well-proportioned light and spacious high-ceilinged open plan area with a contemporary kitchen, stylish sitting area with woodburner and lovely dining area which overlooks the scenic leafy green. Kitchen: Well-equipped and contemporary with integral oven and Miele hob, integral Miele dishwasher, microwave and free-standing fridge/freezer. Living Area: Light airy room with an attractive open fireplace, originial cornicing and large bay window overlooking The Buttlands. Beautifully presented with two comfortable sofas, coffee table, floor lamps and a flatscreen TV. Carefully positioned with the best view is a dining table with six chairs. There is the advantage of free Wifi throughout the flat. Second sitting room / Bedroom 3: attractive room leading off the living area with doors opening out to the garden and an ornamental period fireplace. There is a good quality sofa bed with a pocket sprung mattress and a topper (please inform us if you would like to have this made up for your stay), TV with integral DVD player, chest of drawers. Bedroom 1: Beautifully presented room with French doors opening out to the garden. Furnished with a double bed, bedside tables and lamps and a chest of drawers. En-suite shower room: contemporary walk-in shower, hand basin and WC. Bedroom 2: Spacious room with French doors opening out to the garden. Contains zip-linked beds giving the flexibility to have full size twin beds or a super king-size 6' bed, bedside tables with lamps, chest of drawers and a wardrobe. Bathroom: Panelled bath with shower over, basin and W.C. Built-in medicine cabinet and shaver point. Cupboard housing gas-fired central heating boiler with washing-machine below. There is a cot and highchair available at this property upon request. Although there is no designated off-street parking, there are no parking restrictions on The Buttlands and it is usually possible to park outside. It is just a few steps to the renowned Crown Hotel and also The Globe Inn. There is the added bonus of a private fully-enclosed walled rear garden which is a real sun-trap. The garden has a patio area with a bbq, 6 chairs, table and parasol and a lawned area ideal for children. This is a fantastic location right in the heart of Wells within walking distance of numerous shops and the quay.